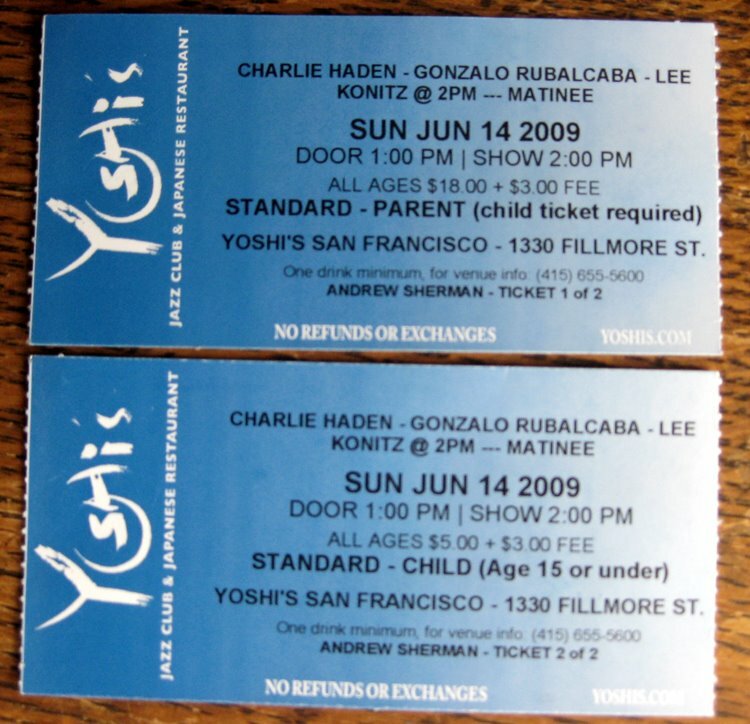 This was my first visit to the San Francisco branch of Yoshi's. It looks very much the same as the Jack London Square branch. It is a large wedge-shaped room, raised at the back with a capacity of about 300. The sound is superb and you can see the stage from wherever you are. This was a Sunday matinee, where you can get a discounted ticket if you go with a child. It is in fact cheaper to go with a child than to go alone, so Grace got forced to go to her first jazz concert. The staff come around to serve you drinks and food: we sampled a delicious malted milk chocolate mousse cake. My idea of what a jazz club should be like is based on Ronnie Scott's and so I was slightly disappointed that it was not smoke filled, but overall Yoshi's is a great jazz club. This trio of players had apparently not played together before this booking. Rubalcaba (piano) and Konitz (alto) started as a duo. Rubalcaba is one of those pianists who colors rather than drives. Konitz seemed to take a while to get going. Next Haden (bass) and Konitz played for a bit before they all played as a trio. Haden perked things up a bit. He doesn't really lead form the from but he made the other players better. The lack of a drummer made for a quiet show, but after a time the stew started to cook up with Konitz leading the way. Unfortunately Konitz seemed to be having a few technical difficulties and a few times you could see he was frustrated that he wasn't playing what he heard in his head. Grace enjoyed the show and would go again to Yoshi's. She also now wants to go to a rock gig. My own first jazz concert was Stan Tracey at Chester Town Hall (which is not a famous jazz club) in about 1976. I remember being very impressed with drummer Clark Tracey who was then about 15.